Why locally sourced food? When it comes to living a healthier, sustainable lifestyle, choosing locally sourced food is a smart choice. Locally sourced food generally comes in the form of organic fruits, vegetables, cheese, and meat. Most of these products are nutritious and promote good health. Additionally, locally sourced fruits, vegetables, and other products offer culinary variety because they change from season to season. Purchasing locally sourced items boosts nearby economies supporting our community. The Strafford Organic Creamery is a one-farm, one-family dairy in central Vermont. We milk 50 Guernseys and market their amazing milk in glass bottles, and in super-premium ice cream. Certified organic in 1997 and bottling on our own since 2001, we are committed to sustainable agriculture and dairy without compromises. Our family has been farming the banks of the Connecticut River in Plainfield, NH since 1950. Today there are three generations of McNamara’s that live and work on the farm together. We are committed to providing excellent care for our animals, quality products and being stewards of the land. Crossroad Farm is a forty acre vegetable farm in Post Mills, VT, one half mile from Lake Fairlee. For over 35 years our extended family and crew have been practicing sustainable agriculture. We grow a wide variety of vegetables, specializing in greens and tomatoes, as well as strawberries, melons, flowers, and bedding plants. Our animals are raised outside in the fresh Vermont air year-round. They graze on organic pastures where they are able to what they like to do. We specialize in rare breeds for several reasons. The meat from heritage breeds is far more flavorful than the factory farm meat found in most supermarkets today. These breeds fit our cold, rough terrain and can be outside all year. Also, preserving these rare breeds protects genetic diversity. Since 1995, we’ve been lucky enough to live and farm in one of the most beautiful places we know. It’s a life that wouldn’t be possible without the loyal support of so many people who believe in us and the simple notion that good, healthy, fresh produce is something worth getting excited about. Long Wind Farm began in 1984 with Dave Chapman and a team of oxen. 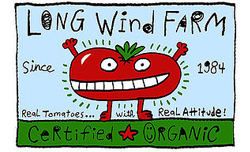 For three decades, we have provided New England with truly delicious and organic tomatoes. Grown in Vermont soil in glass greenhouses, our tomatoes are available as early as March and as late as December each year. 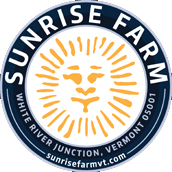 Sunrise is a Vermont hill farm that has been producing food and fiber for more than two centuries. 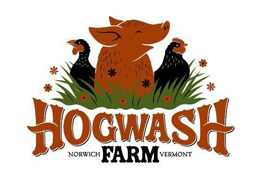 In addition to the vegetables, Sunrise Farm provides chicken, lamb, honey, and maple syrup to the farm members along with saw timber and biomass chips for the commercial market. Cedar Mountain Farm is located in Hartland Vermont. The small family farm is home to 60 registered jersey cows, 4 draft horses and five acres of vegetables. Our farm produces milk, beef, vegetables and is home to the Hartland 4-H Cattle Club.